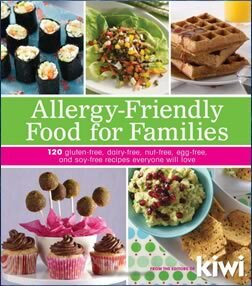 Allergy-Friendly Food For Families is a collection of kid-friendly recipes compiled by the editors of Kiwi magazine. This book offers practical meal options that are free of the five most common food allergens– wheat, dairy, eggs, nuts and soy. An introduction is provided to help you understand food allergies and how they affect the body. The signs and symptoms of food allergies are described so you can identify if anyone in your family might be affected. You are then offered advice on how to manage food allergies and when it is advisable to seek medical attention. Information is also included on the importance of reading food labels and how to stock an allergy-free pantry. All of the recipes included in the book are free of at least three of the major allergens. Many of them are free of all five allergens. Color-coded icons at the top of each page make it easy to identify if a recipe is suitable for your family. A comprehensive index also categorizes the recipes by allergen. This food allergy diet includes ideas for breakfast, lunch, dinner and snacks that will appeal to the whole family. Many are familiar comfort foods like cookies, pizza, sandwiches, burgers, noodles and potatoes. Turkey, chicken, tuna, beef, cheese, brown rice, rolled oats, cornmeal, quinoa, buckwheat, almond flour, tapioca flour, sorghum flour, rice milk, black beans, lentils, tofu, spinach, sweet potato, bananas, applesauce, flaxseed, pumpkin seeds, tahini, cashews, brown sugar, maple syrup, xanthum gum, canola oil. Click here to purchase this food allergy diet for a discounted price. Provides options for families struggling with food allergies. Recipes will appeal to the entire family. Offers ideas for healthy snacking and party food. Includes color photographs for many of the recipes. Simple recipes with clear instructions. Some ingredients may be difficult to locate in regular grocery stores. Many of the recipes will not be suitable for those with multiple allergens. Some of the recipes include unhealthy ingredients such as sugar and margarine. Allergy-Friendly Food For Families provides recipe ideas for busy families that are following a food allergy diet. However, many of the recipes contain at least one or two allergenic foods, such as nuts, dairy or wheat. Those allergic to more than one food, or families including individuals with different allergies, will need to be aware of this. The book makes it easy to identify the allergens in each recipe but in some cases substitutions may still be necessary.